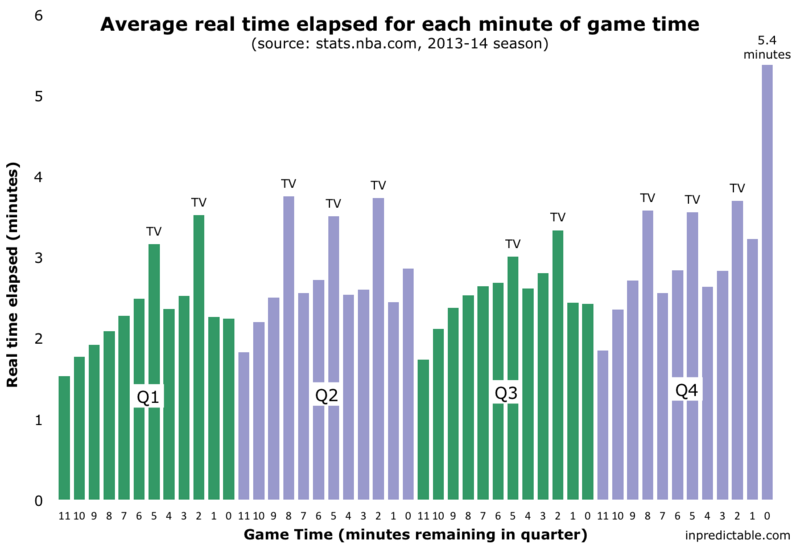 Home / NBA / pointlessness / How long is each minute of NBA gametime? In a recent post for FiveThirtyEight, Carl Bialik took a look at the length of college basketball games, particularly the grueling slog that the last minute of game time often becomes. The NCAA currently does not track game length as an official stat, so Carl had to rely on some nice work from Regressing (a Deadspin blog) for the raw data. He also contrasted the length of NCAA basketball games to those of other major sports, noting that the NBA, in contrast to the NCAA, does maintain official stats on game length. Having been snooping around the Stats section of NBA.com recently, I noticed that not only does the NBA track game length, it also provides a timestamp for every play. So, not only can we see how long that last minute of regulation drags on, we can do the same for every minute of game time. The chart below summarizes that data for the 2013-14 NBA season. The final minute of the fourth quarter lasts five and a half minutes on average. The median length is 4 minutes. At the extreme end, the November 18 game between the Nuggets and Thunder featured a final minute that took twenty minutes to complete. Those last 60 seconds featured two official reviews and a plethora of free throws (12 in total) as the Nuggets repeatedly fouled the Thunder in an unsuccessful attempt to stave off defeat. In the pre-shot clock era, the NBA apparently found late game hacking to be rather unseemly and instituted rules to discourage it. In the final three minutes of regulation, made free throws were followed by a jump ball, rather than automatically awarding possession to the fouling team. The shortest minute of game time is always the first minute of every quarter. The last minute of the first half takes longer than the last minute of the first or third quarter. The spikes in the bar graph marked "TV" correspond, not coincidentally, to the timing of NBA's mandatory timeouts (aka "TV timeouts"). Because why not. The chart below summarizes game length by broadcast network (another readily available field in the stats.nba.com data). 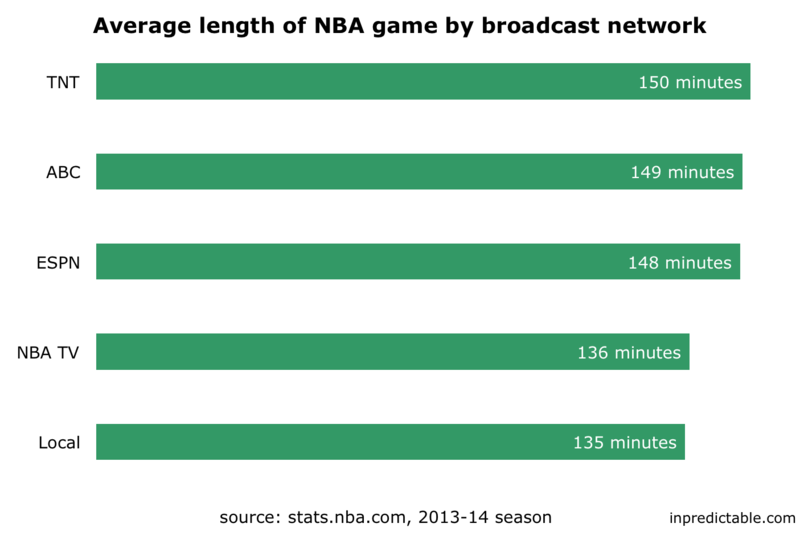 As you can see, with the exception of NBA TV, nationally broadcast games take 15 minutes longer than local broadcasts. The extra length is presumably due to additional commercials. An examination of the detailed data verifies this presumption, with the biggest gap in length between national and local broadcasts occurring when NBA rules require mandatory timeouts.